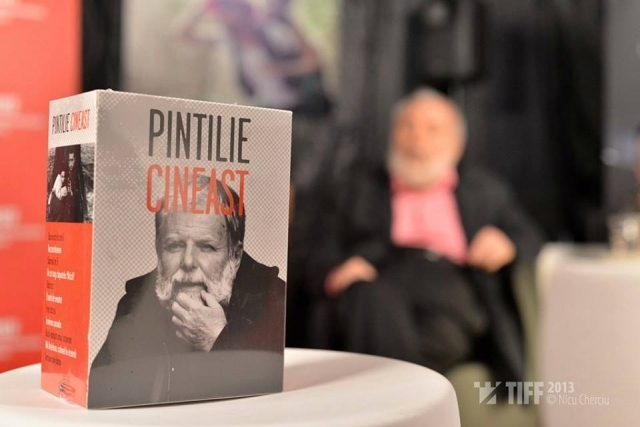 The DVD set „Pintilie. Cineast” was awarded the Best Special Features on DVD Award during the 11th edition of the DVD Awards, part of Il Cinema Ritrovato festival (June 29th- July 6th), organised by the Cinémathèque in Bologna and dedicated to classical film, arhive masterpieces and restaured films. The bonus DVD of the box comprises more than three hours of video excerpts selected by Lucian Pintilie, together with Mihai Chirilov, reworked and reedited by Dana Bunescu. The DVD Awards jury consisted of Lorenzo Codelli (vice-director of the Friuli Cinémathèque Gemona), Alexander Horwath (director of the Austrian Film Museum), Mark McElhatten (selector, founder and director of the avantgarde film section of the New York Film Festival), as well as the renowned film critics Paolo Mereghetti and Jonathan Rosenbaum and was chaired by Peter von Bagh (Il Cinema Ritrovato’s artistic director). DVD Awards is the worldwide most important event of the kind, trying to encourage and to create awareness for quality home entertainment by selecting every year the most valuable and best crafted projects worldwide. About 30 DVD and Blue- Ray collections were shortlisted, among them the restaured version of Michael Cimino’s controversial „Heaven’s Gate”, „Lost And Found: American Treasures From The New Zealand Film Archive (UK – USA/1914 – 29)”, a project of the National Film Preservation Foundation (US), „Polish Cinema Classics Volume II” , an anthology produced Second Run. „3 Films by Roberto Rossellini starring Ingrid Bergman”, produced by The Criterion Collection, was awarded Best Blue- Ray Box Set, whereas the „Jean Epstein Coffret” produced by the French Cinémathèque and Potemkine Films was declared Best DVD Box Set. Eureka Entertainment’s „Late Mizoguchi – Eight Films” was elected for the category Best Special Features on Blue- Ray. Conceived and coordinated by Mihai Chirilov, the artistic director of Transilvania International Film Festival, the DVD Box „Pintilie. Cineast” is a cinefile’s collector’s item. Launched at TIFF 2013, in presence of Lucian Pintilie, and distributed by Transilvania Film, the box comprises 11 films of the much appreciated Romanian filmmaker and a bonus DVD featuring never before published materials that put together a portrait of the director: cinema lessons, press conferences, round tables, TV interviews, hommages, retrospectives etc. The 11 restaured features are: „Sunday at Six”, „Reenactment”, „Ward No. 6”, „Carnival Scenes”, „Balanța”, „An Unforgettable Summer”, „Too Late”, „Last Stop Paradise”, „Afternoon of a Torturer”, „Niki and Flo”, „Tertium non datur”. The DVD Box is produced by Transilvania Film and Filmex, with the support of The National Centre of Cinematography and of ODS (Optical Disc Solutions). Technical details: 12 discs (11 films + 1 bonus disc); Region: All-region; Subtitles: Romanian, English; Total time: 1212min. Romanian Distributor: Transilvania Film.